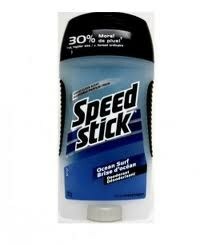 Speed Stick is a brand of deodorant/antiperspirant that, as the name suggests, comes in stick form. The product is owned by its parent company, Colgate-Palmolive. It was formerly known as "Mennen Speed Stick" prior to Colgate-Palmolive's purchase of The Mennen Company. Currently, the products feature the words "by Mennen" in a small font on the label. Speed Stick comes in both deodorant and antiperspirant forms. Speed Stick is both a sponsor and the official antiperspirant of the NHL.